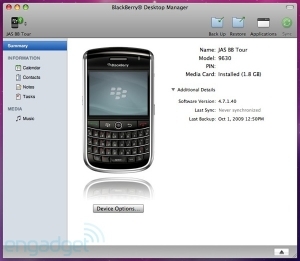 BlackBerry Desktop Manager for Mac finally available | BlackBerry Blast! All you Mac BlackBerry fans can now rest a little easier as the BlackBerry Desktop Manager for Mac is now out. Forget the Missing Sync, or VMWare and Parallels to get the BlackBerry Desktop through Windows. Now you can sync with the official BlackBerry Desktop Manager for Mac. See the link below for the download.